The new General Data Protection Regulation (GDPR) is set to replace the Data Protection Directive 95/46/ec effective May 25, 2018. The GDPR is directly applicable in each member state and will lead to a greater degree of data protection harmonization across EU nations. Although many companies have already adopted privacy processes and procedures consistent with the Directive, the GDPR contains a number of new protections for EU data subjects and threatens significant fines and penalties for non-compliant data controllers and processors once it comes into force in the spring of 2018. With new obligations on such matters as data subject consent, data anonymization, breach notification, trans-border data transfers, and appointment of data protection officers, to name a few, the GDPR requires companies handling EU citizens’ data to undertake major operational reform. Data controllers and processors alike must designate a data protection officer to comply with the new EU General Data Protection Regulation. Our training proposal is developed to prepare candidates to this role. It is deisgned from a triple perspective, Technological, Corporate and Legal, taking into account each’s practical application and industry best practices and experiences in subjects such as security, personal data protection and IT Governance. The Certification Program – Certified Data Protection Officer has been developed to provide professionals with all the skills, abilities and knowledge required for the integral protection of personal data, as well as adapting to the new regulatory, organizational and technical framework. Module 1 : Privacy Fundamentals. Module 2 : European Framework. Module 3 : National Framework. Module 4 : International Framework. Module 5 : Data Protection and Information Technologies. Module 6 : Privacy Security. Module 7 : Management and Incident Response. Module 8 : Information System Audit. Notre partenaire, Excellium, est Accredited Training Center (ATC) de PECB et EC-Council.Les certifications que nous proposons sont gérées par ces certifications body mondialement reconnues. Même si nous proposons des formations Ad-hoc (notamment sur GDPR), nous ne proposons jamais de certification nous-même. 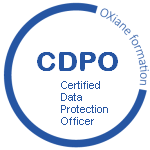 La certification CDPO (Certified Data Protection Officer) est basée sur le cours développé par IAITG et est accréditée IAS selon ISO 17024 par PECB. 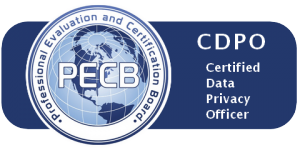 C’est une certification internationalement reconnue, sous accréditation officielle, comme toutes les certifications de personnes développées par PECB Inc.
With the objective to solve the doubts and gaps, answering to the needs of both the private and public sectors regarding the General Data Protection Regulation. Acquire and master all the necessary knowledge and competences for the protection of personal data, managing its risks and compliance, and the opportunities to create value for an organization through data protection. This training will prepare its participants to lead all the processes necessary to adopt and meet all the demands and requirements from the GDPR within an organization. 2. Demonstrating 2 years experience in functions involving the treatment of personal data All participants attending at least 80% of the lectures will receive an Attendance Certificate In order to obtain the certification Certified Data Protection Officer, all participants will have to successfully pass the exam.